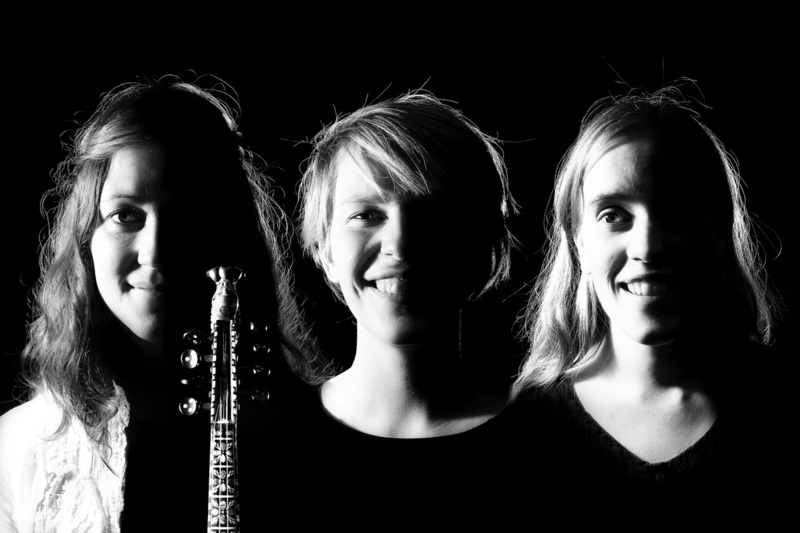 Hildur Dance Company is a group of musicians and dancers who create artistic productions based on folk dance and music traditions from central Norway. The performers share a common interest in the interdependent relationship between dance and music – and in exploring space and inclusion. With a playful and open approach to tradition, the company creates moments of surprise, melancholy, and clarity in their various productions, which are aimed at school students, the elderly, and the general public. ​- from times past, we have the same rhythm. Mother, father, and grandfather – they all danced polka. 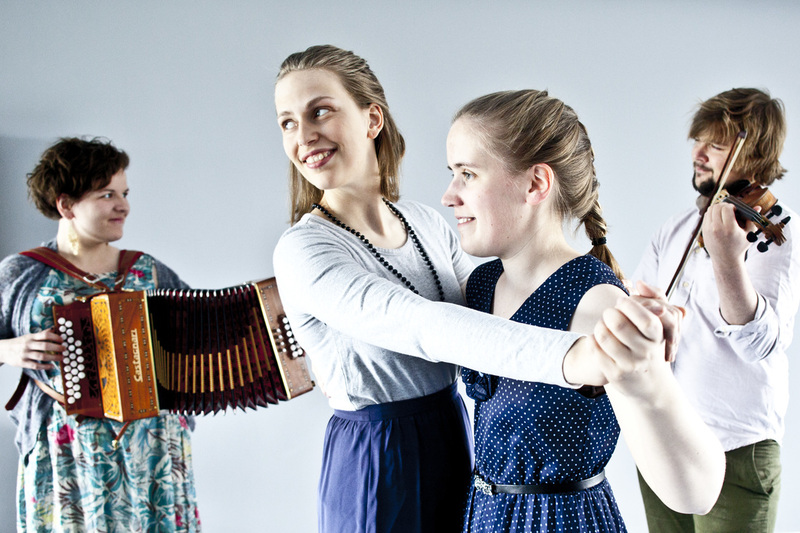 Jo Einar, Anna, Hilde, and Mathilde bring you familiar and beloved dances accompanied by swinging fiddle and accordion tunes. Polka, tango, and waltz in perfect harmony. Maybe they’ll also ask you to dance? ​Toured in Steinkjer Kommune under the auspices of the Cultural Walking Stick (Den Kulturelle Spaserstokken) in fall 2015. REK takes you through the peephole into Hildur Dance Company’s working laboratory in the year 2015. You’ll catch glimpses of springar, vim and vigour, clumps of people, Møre og Romsdal, melancholy, eight feet, 76 buttons, grins, songs, four backs, a button accordion, vulnerability, foot-tapping, a fiddle, transformation, a PARTY. Four gluttons from three Norwegian counties lick the dust off of their favourite goodies picked out of the side pockets of the world’s richest nation, and put them into gilded bowls. ​Have you tried a pancake turn? Or slapping your knee in time with the music? In a world full of different cultural expressions and forms of communication, learning about older traditions can create a sense of identity. Danseverkstaden - Spring! aims to generate a shared experience of live music and dance with roots in Møre og Romsdal. As an audience member, you will experience an interactive performance based on several springar dance forms, and you’ll get to dance both a halling and a springar. Danseverkstaden - Spring! takes you on a journey through traditional dance, and when the journey is over, you’re left with a dance in your body. The workshop is dynamic and flexible, and can be adjusted to suit children, youth, and adult audiences. The following springar forms are included in Danseverkstaden - Spring! : polsdans from Nordmøre, springar from Romsdal, springar from Tafjord, springar from Sykkylven/Stranda, springar from Nordre Sunnmøre, and springar from Søre Sunnmøre. Danseverkstaden - Spring! was showcased at Kulturtorget 2014 in Molde. The workshop has toured under the auspices of the Cultural Rucksack (Kultursekken) in Møre og Romsdal since fall 2014, and has been presented for over 1200 students in Møre og Romsdal. Mathilde Øverland is a dancer and folk singer from Molde. Since completing her BA in Traditional Dance Performance (NTNU/The Ole Bull Academy) she has worked to push the tradition in new directions, and is interested in the interaction between dance and live music, and the organic/spontaneous qualities that are inherent to the tradition. This has resulted in constellations such as FOLK and BROLAND. Mathilde is also Project Manager for the youth folk dance project Akersarv - Bygda Dansar i Akershus. Hilde Fjerdingøy is a diatonic button accordion player and composer with a powerful poetic voice and musical finesse. Fjerdingøy has a master’s degree in Nordic Folk Music and, in addition to playing traditional music from all of the Nordic countries, she has immersed herself in traditional music from her home region, Helgeland. She is a member of the Swedish-Norwegian band Rim, as well as Duo Fjerdingøy & Andersson. Jo Einar Jansen is a fiddler, Hardanger fiddler, and singer from Frosta in Nord-Trøndelag. He has a Nordic Master in Folk Music, and a creative, powerful, and dynamic playing style. With roots in folk music from his home county, Jo Einar plays traditional music from all of the Nordic countries. He is a member of groups such as Duo Jansen/Jüssi and Rim, and is also an excellent solo performer and an outstanding dance fiddler. Laura Ellestad is an award-winning Canadian Hardanger fiddler with roots in Valdres. She has a bachelor’s degree in Traditional Music from the Ole Bull Academy and a master’s degree in Performance from the Norwegian Academy of Music. Ellestad’s playing is warm and sincere, with a fine balance between the lyrical and the dynamic. She is currently a PhD research fellow at the Norwegian Academy of Music, where she is researching performance practices among Norwegian-American fiddlers in the first half of the 20th century. Anna Gjendem is a young, modern dancer from Molde with a solid grasp of the local dance traditions. She has a BA in Traditional Dance Performance (NTNU/Ole Bull Akademiet) and a master’s degree in Traditional Arts from Telemark University College. In addition to her position as Head of the Folk Music Archive for Møre og Romsdal, she works full time as a performing traditional dancer. Gjendem is passionate about presenting local dance traditions in both time-honoured and innovative ways!